The Carlson Small Dog Crate creates a safe, den like, environment for your pet. 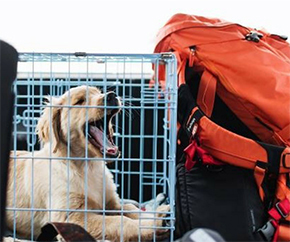 The durable crate features one door at the front and a multi-point locking system, securing your pet and providing owners with peace of mind. For portability, the wire crate folds nearly flat, making it easy for travel and storage. Perfect for small breeds up to 22” long and up to 16” tall, the Single Door Wire Crate can be used from puppy to adult stage. Mixing functionality with convenience, the Carlson Small Dog Cate features a steel wire frame, that sets up in seconds. Take down is just as fast. When ready to break down, the wire crate easily folds flat and latches. Providing superior portability, the Single Door Wire Crate can easily be carried or stored in a closet, car, or plane. Measuring 24” L x 18” W x 19” H, the crate provides a comfortable environment for small breeds. If you’re using it to train a puppy, the wire crate features a removable bottom pan, so it’s easy to clean if accidents do occur. Making sure your pet is secure in it’s crate has never been easier with the multi-point locking system. 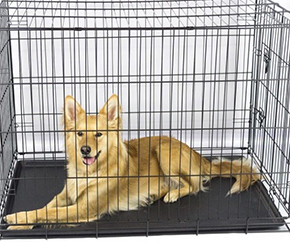 The Carlson Small Dog Crate is backed by a manufacturer’s limited 90-day warranty. Carlson Pets Products are designed specifically for your pet to suit all breeds and lifestyles. 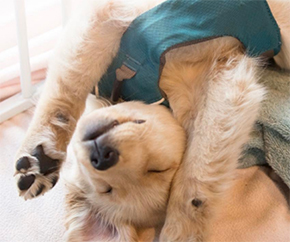 Give your puppy or dog a place to feel secure and safe with his or her own den. Our line of Pet Crates is made of quality materials, durable, and provides a safe environment for your pet. When used correctly, Pet Crates are a great tool to use when house training.